Kristin Hawkins joined the firm in 1985. She has been a design team leader or project manager for a number of major commissions. She is currently leading the design team for a natural history museum in China. As Design Team Leader, her recent work includes the comprehensive land-use plan, FutureVU, for Vanderbilt University’s 333-acre campus, a vision for campus stewardship and sustainability. She also designed the master plan and building, for the Center for Innovation in Medical Professions, a 100,000-square-foot, state-of-the art health care education center at Cleveland State University, bringing together Nursing, Health Sciences, Student Health Services, and the Speech and Hearing Clinic in partnership with Northeast Ohio Medical University. 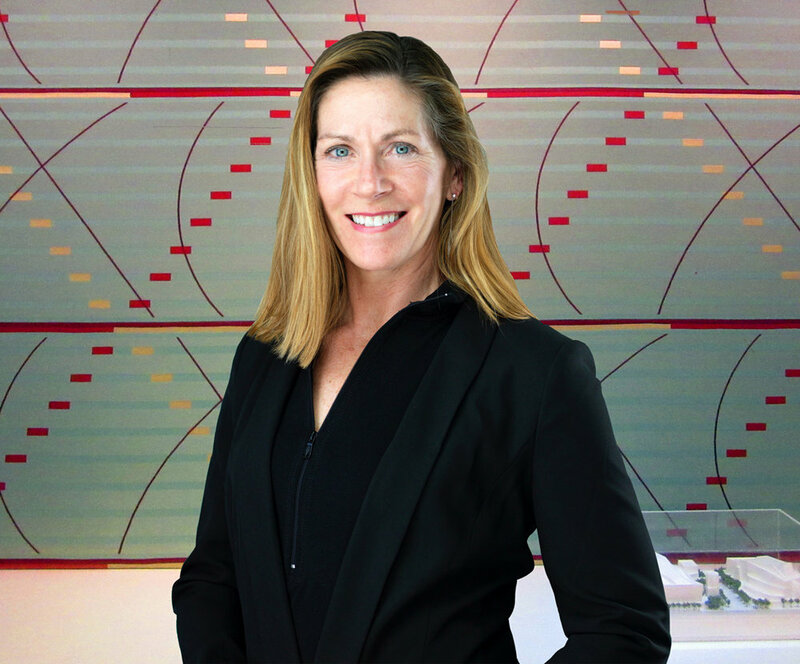 Most notably, she was Design Team Leader for the Red Building, the 800,000-square-foot final building of the award-winning Pacific Design Center in West Hollywood, California. Additional academic work includes the site master planning and design of the 250,000-square-foot Physics and Astronomy Building at the University of Washington/Seattle, which includes laboratories, faculty and administrative offices, classrooms, computer facilities, four auditoriums, a planetarium, and a library. Ms. Hawkins was also a senior designer for the Joe Rosenfield Campus Center, which consolidated all dining and student activities at Grinnell College into a three-building complex. Ms. Hawkins has been involved in several institutional commissions as Design Team Leader, including the Greenwich Library Peterson Addition and Renovation. As Project Manager, Ms. Hawkins worked on The Renee and Henry Segerstrom Concert Hall and Samueli Theater at the Segerstrom Center for the Arts, in Orange County, California, and a senior designer for the Schuster Performing Arts Center in Dayton, Ohio. Earlier at PCPA, Ms. Hawkins worked on the master plan for Fan Pier, an 18.5-acre site on the Boston Harbor. As Senior Designer, her work included Kuala Lumpur City Centre, Wachovia Bank Headquarters in Winston-Salem, North Carolina, One Market in San Francisco, and Gaviidae Common in Minneapolis. She was a designer for Carnegie Hall Tower in New York and Norwest Center in Minneapolis. Before joining the firm, Ms. Hawkins was a designer for Bull Field Volkmann Stockwell and Kurtzman & Kodama Architects in San Francisco and VMDO in Charlottesville, Virginia. She received a Bachelor of Science in Architecture from the University of Virginia and a Master of Architecture from Yale University. She has been a lecturer at Yale School of Architecture since 2009 and a guest critic at Harvard Graduate School of Design and Rhode Island School of Design.